TERAMPIL is a journal of basic education and learning p-ISSN 2355-1925 e-ISSN 2580-8915 which is managed by Prodi PGMI Faculty of Tarbiyah and Teacher Training of Raden Intan State Islamic University of Lampung. 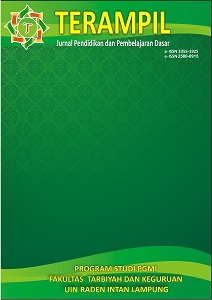 This journal is published twice a year and serves as a tool for researchers, academics and practitioners interested in basic education and learning studies and wishes to channel their thoughts and findings, especially in relation to studies in science at madrasah ibtidaiyah / elementary schools. The articles contained are the results of research, scientific and critical and comprehensive review of the important and current issues covered in the journals. PENGEMBANGAN MODEL PEMBELAJARAN MUSIK MELALUI PEMANFAATAN GAMOLAN LAMPUNG UNTUK SISWA SD DI BANDAR LAMPUNG.